* Change distance and clipping to default values automatically when creating a new picture. * Change distance and clipping to default values automatically after clicking "D" button. * No longer change distance or clipping after touching either of them manually. * Do not change distance or clipping when editing an existing picture. I think the first (emphasized) bullet is not a good idea, as Ramone explained - if you place a picture, adjust its position with Select tool and then come back to Picture tool to create new ones, it's too surprising that the values have changed. * Picture tool remembers the last selected picture (including the selected clipping/distance). (a) always when changing picture/texture, except after they've been touched after the tool window was opened. (b) only when changing picture/texture after opening the picture tool for the first time or after clicking "D". * Added support for high DPI monitors. * SLE: Inactive grass edges are now shown dashed. * SLE: Bugfix: Crash if LGR had no images. * SLE: Bugfix: Too many pictures were excluded from the list of available pictures. iCS, dani, Schumi: I wrote those down. Could there be a way to force text rendering even if there are rendering errors? I'm trying to import a lot of symbols at once and random ones are getting topology errors (one example: https://emojipedia.org/ram/ , doesn't work with default text, works with bold). It's quite much work to figure out which characters are not getting rendered, and if there would be a way to force rendering it might not be a lot of work to fix. If it's not possible, would it be possible to turn unrenderable characters into 'n/a' or an empty box or something? i downloaded the newest version and program stops working when the main window gets opened. older version i had (2011) opens normally. any way to solve? A few issues/feature requests. Might have mentioned some of these before, don't remember. - While editing title ctrl c/ctrl v applies changes to lev. - Renaming filename is buggy, it seems like it works like this: When you edit the filename editbox and click OK, SLE renames the lev file and updates the window title. However it does not apply changes made since last save, and if you save again it saves back to the old filename. Expected behavior for me would be: Save any changes - Rename level file - Load new level file. - Crosshair doesnt work in cut-connect/draw/pipe/zoom/ellipse/text modes. - Trying to move the selected texture by clicking in the area where it overlaps with unselected textures makes it switch selection instead. Image Link - Trying to move selected (Blue) textures where it overlaps with unselected (yellow/white) textures cancels the selection and moves the texture behind instead. This sometimes makes it impossible to work with complicated textures without doing a lot of workarounds. - Would love to have hotkeys for 'Transformation' and 'Snap to grid'. I use these functions all the time and hotkeys would improve workflow a lot. Also some bug with poly operations, such as in this example, but it happens with other poly operations as well. Haven't found out exactly why/when it happens, doesn't happen always even with much more complex symmetric difference operations. 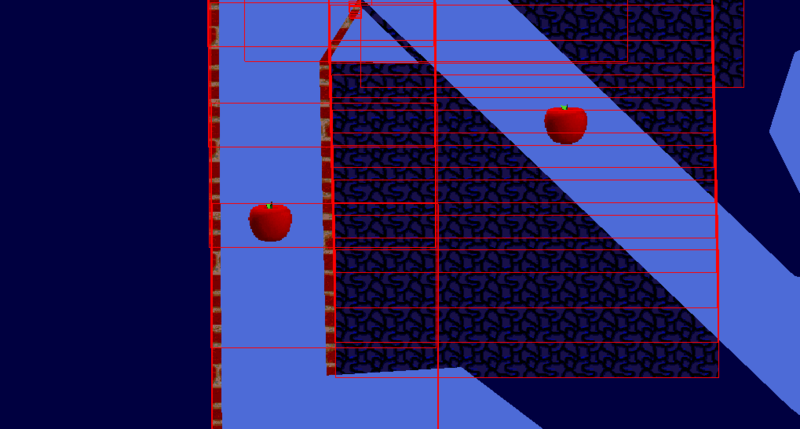 Just quite often I notice there's a ton more vertices than there should be. Also please take away auto-flower when loading lev without one. Don't really get why need this, it's so easy to add flower anyway, and often it's desirable to have levs without flower, for example for apple battles. Also I have some pre-made stuff saved in other levs so when I import, it creates a new flower. and often it's desirable to have levs without flower, for example for apple battles. Never mind my requests for hotkeys, it's quite easy to setup in AHK. edit: Also accidentally found the hotkey for transform, wonder how didn't find before. edit2: What I'd really like though would be holding ALT to work like it does in chrome for text, so while holding alt you never start moving or selecting stuff accidentally and always select stuff in a rectangle. Duno if well explained, ask me again if it is confusing. Hmm, seems like alt-clicking doesn't work quite like I thought. When I alt-click this grass poly it also selects surrounding textures, but for some reason not all. Is this intended behavior? Good findings, I reproed and wrote these down. Transform tool already has a hotkey (space), although currently Select tool must be active. Oh ye you noticed this already. I remember (a long time ago) opening a lev without a flower and it gave interror. I think that was the reason I disallowed deleting all flowers. Do flowerless levs work these days? Nice, never knew that :O and works also in Firefox. Definitely a sensible feature, wrote it down. I remember making it so that it only selects the pics whose centers are inside the polygon. I was afraid that it would otherwise select too much, I guess. But maybe it needs to be more "greedy". Lev without any objects gives internal error. As long as there is either an apple or a flower it should work. Ok now noticed that the actual corners were outside of the polygon, didn't notice this before, guess it's understandable behavior then. When checking topology, and there are too many vertices, the error counts grass vertices also. so a lev with 5131 ground vertices and 500 grass vertices gives error 'too many, max: 5130, current: 5631', while a lev with 5130 ground vertices and 500 grass vertices passes topology test. viewtopic.php?f=1&t=9888 Would be great if it would be pos to include this font built into elmanager. You're right; I finally bothered to check it. :) Next version will only require 1 object of any kind in addition to start object. There is a new topology error if you forget to add one. Thanks, that's fixed for next version! Sorry, it looks like font handling is still bugged on some systems. It's hard to fix it because they don't reproduce on my machine. If you manage to get the full error message, I might be able to investigate it. I wrote this down but I suspect it won't be very easy to make. The font dialog is kind of an opaque Windows component that is very hard to customize. But I won't say it's impossible. For example, I managed to make it auto-preview fonts when changing anything in the dialog (otherwise you'd need to click Apply every time). danitah wrote: - Renaming filename is buggy, it seems like it works like this: When you edit the filename editbox and click OK, SLE renames the lev file and updates the window title. However it does not apply changes made since last save, and if you save again it saves back to the old filename. Expected behavior for me would be: Save any changes - Rename level file - Load new level file. Edit: Released the update now. Changelog. Now this is a recurring problem for me, topology check won't find any errors, but i get error message in elma. If you move the vertex in the bottom left corner, you will see there are 2 vertices at the same place. Last edited by Smibu on 10 Nov 2018, 19:30, edited 1 time in total. Would be nice with 'right click in empty spot' -> 'put start here' function. When editing large levs always spend a lot of time just looking for where start is. Please hotkey (+/- or whatever) in picture tool to change orientation so you can place from the corners. Default is in the center but it makes it quite hard to work with zoomed in corners. By default you place pictures like on the very right, but it would make life much easier if could toggle between placing in the other modes also. danitah wrote: By default you place pictures like on the very right, but it would make life much easier if could toggle between placing in the other modes also. Can you clarify what problem this would solve? Especially the part "it makes it quite hard to work with zoomed in corners". For example, would hiding the mouse while placing a picture achieve the same thing? When doing something like this you generally have to place textures zoomed out, and then zoom in to more accurately position them. Another problem arises when it's quite complicated with many different textures and/or pics layered on top of each other and some of them are simply not selectable, and you have to move away textures with grid lock to make sure you can edit stuff before moving them back into the same exact spot. There's also many situations where this would just make life a little easier, without it being a problem: Whenever the optimal placement of a texture is defined by one of the corners. I know it's not the same, but Tools menu/Import level(s) can load any number of levels at the same time. Only drawback: loads whole level, have to manually delete unnecessary parts. Not the best way if you need 1 polygon from a giga size level, but it's very useful in most cases. Especially when making chainlevs. danitah wrote: There's also many situations where this would just make life a little easier, without it being a problem: Whenever the optimal placement of a texture is defined by one of the corners. Ok dani, I wrote that down. jblaze: Yes tabs have been requested many times and it's on the list. Needs work of course, so I'm unsure if it will ever be done. iCS: Ah yes, I forgot to fix that earlier. Will be fixed for next version. But texturizing with custom masks won't be as accurate as the standard masks because I've hardcoded some values about the transparent pixels of the standard textures. I will probably put a warning message about it. ROKKEBOL: I can consider that if someone gives me the source code for the name generator and if zworqy is okay with it. Updating to this version must be done manually, so download here. The update mechanism got broken because of GitLab's TLS update.